On November 7, the Houston Chronicle ran a front-page story called ‘The Divide: Hunting for a home,’ exploring the challenges facing people with Housing Choice Vouchers in Texas’ largest city. Reporter Monica Rhor shadowed Jessica Vaughn, an African-American single mother who finds that most apartments won’t accept her voucher, are out of her price range or present other problems that render her ineligible. Vaughn is just one of thousands of voucher holders in Houston dealing with housing insecurity. Housing Choice Vouchers are supposed to do what their name implies – provide low income families with the opportunity to choose where they would like to live, by covering a portion of rental costs for units that would otherwise be unaffordable. Previously known as Section 8, the program suffers from unfair stigmas against renters that lead to widespread voucher discrimination. Many landlords refuse to accept vouchers, which are predominantly held by racial and ethnic minorities. 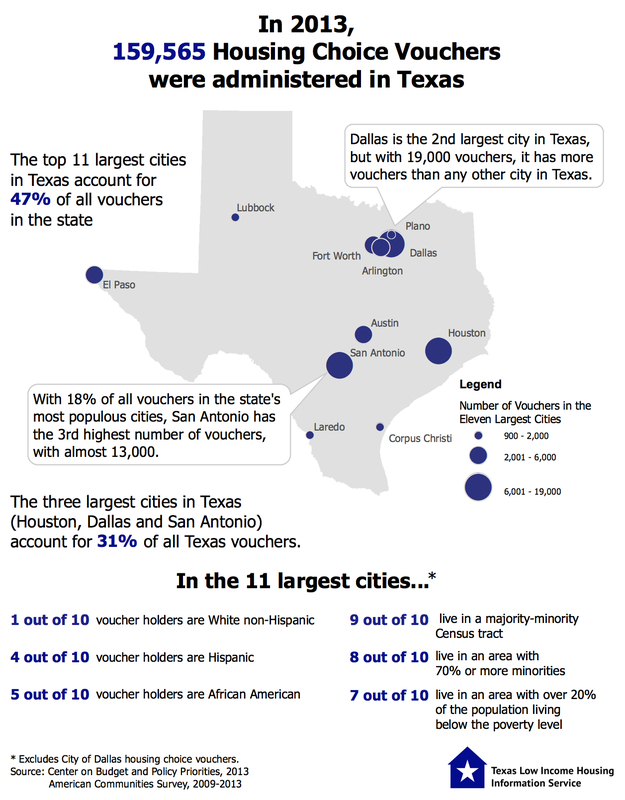 As of 2013, nine in 10 voucher holders in Texas were African-American or Hispanic – and, due to discrimination by landlords operating in higher opportunity, integrated neighborhoods, nine in 10 lived in a majority-minority area. Because of voucher discrimination, Housing Choice Vouchers often provide little housing choice at all. Our report explores the way that Houston’s voucher holders are forced to find housing in limited neighborhoods that are predominantly racially segregated and economically depressed, with higher crime and lower-performing schools. This entry was posted in Local issues, Uncategorized and tagged Fair housing, Houston, source of income, Vouchers. Bookmark the permalink.